He squatted on the cold ground that freezing winters day. He was indifferent to the weather and oblivious to the traffic that passed close by. He was lost in his music, and captivated by the rhythm and melody of the tunes that were his living and his life. The sweet sounds came from his very soul and his two brothers played along in perfect harmony. He was an uninhibited banjo player and he played as if it was an extension of his body. But those who were knowledgeable claimed that his best instrument was the Fiddle and described him as one of Irelands finest musicians. Occasionally he would introduce some diversity into his performance with a few tunes on the Tin Whistle. He could play classical music if he thought he had a knowledgeable audience but mostly his raw talents were lost on the unresponsive passers by. His name was Joseph ‘Hanta’ Dunne and his large family depended on the daily contents of his shoebox and the kindness of strangers. He and his brothers were settled travellers and they had inherited both the gift of music and the curse of blindness from their forefathers. They were known as the Blind Dunne brothers and no festival was complete without their presence. They had a deep routed love of the traveller style of Irish music and the melodies just flowed from them. Such talent deserved a national platform and the rewards of countrywide success. No such luck for these inoffensive performers! Through accidents of birth their stage was limited to the streets of Limerick. No records, no concerts, no recognition, no fans. 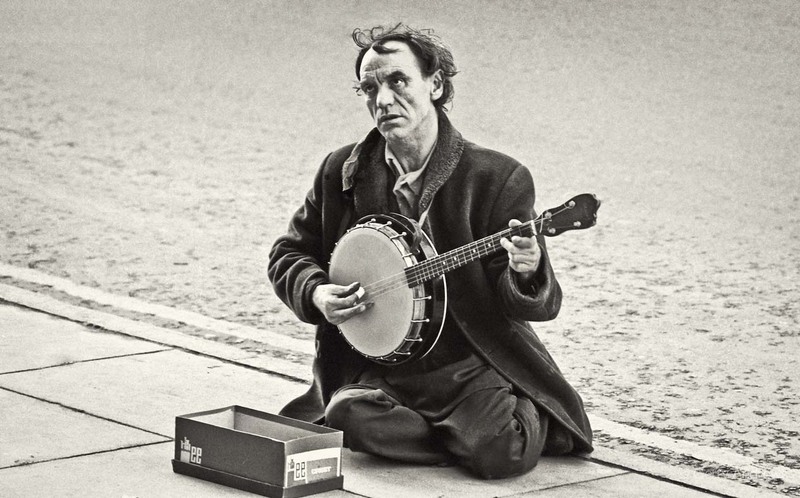 They were unwelcome in some quarters, persecuted by Gardai for busking and scorned by a spiteful few. But their music and culture prevailed. They were torchbearers and the flame that passed from generation to generation remained unquenched. They have long departed this world but their legacy remains. A new generation of musicians have inherited their talents and a more enlightened and educated society has given silent recognition to Hanta and his brothers for helping to influence the spread of Irish music and keeping their traditions alive. Bless you, mr. Andrews, for these wonderful stories and pictures, bless you for giving us a window to life as it were. I just saw the exhibition today in Dublin, I was touched beyond words and I will treasure the book.